Ginkgo petrified wood at the Ginkgo Petrified Forest State Park / Wanapum Recreational Area, Vantage, Washington. Petrified wood was discovered in the region in the early 1930s, which led to creation of the park as a national historic preserve. 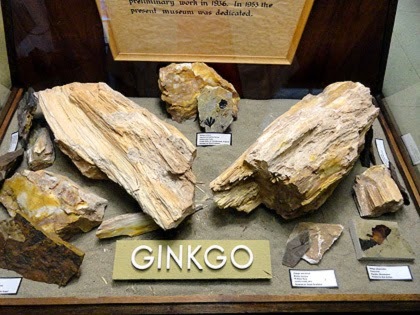 Over 50 species are found petrified at the site, including Ginkgo. 'During the Miocene epoch, around 15.5 million years ago, the region was lush and wet, home to many plant species now extinct. A number of these trees were buried in volcanic ash, and the organic matter in the tree trunks was gradually replaced by minerals in the groundwater; the resulting petrified wood was protected for millennia by flows of basalt. Near the end of the last ice age, the catastrophic Missoula Floods (about 15,000 BC) eroded the basalt, exposing some of the petrified wood.' Read more.